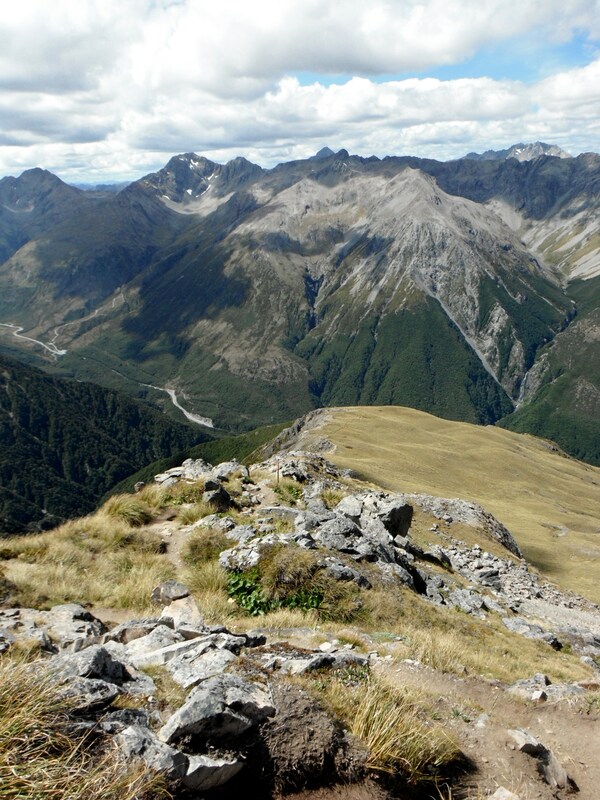 Few places are more awe inspiring than the tops of mountains, especially mountains in New Zealand’s southern alps. In these past few days I have had quite the adventure. It started, as many adventures do, with a simple idea. 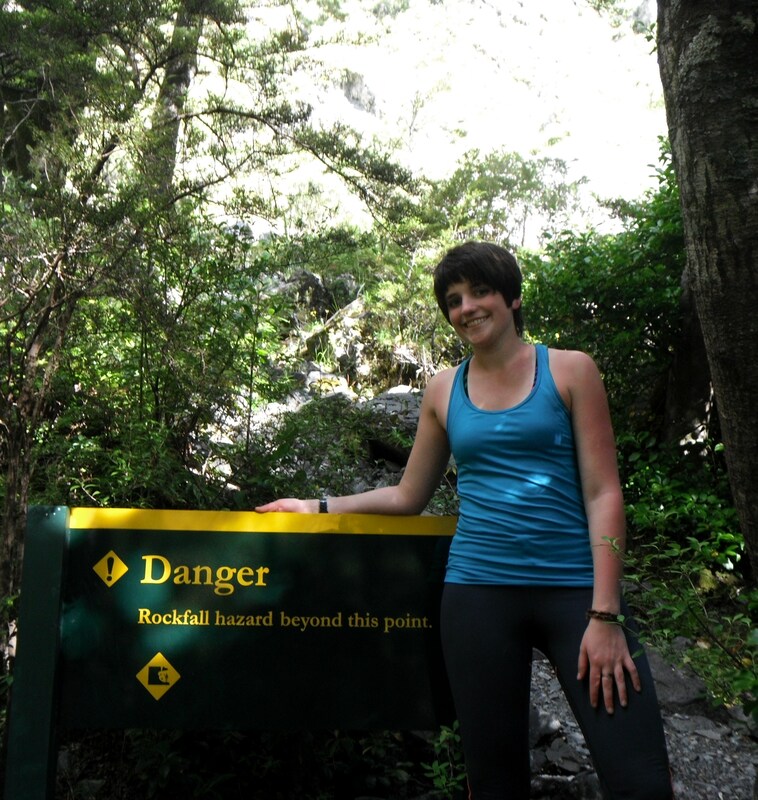 I have explored a little bit of CHCH and a little bit of the surrounding area but I had not seen the mountains and rivers that made me want to come to NZ in the first place. Don’t get me wrong, I like cities and oceans, I like them a lot. But my heart lives in the mountainous landscapes of the world. 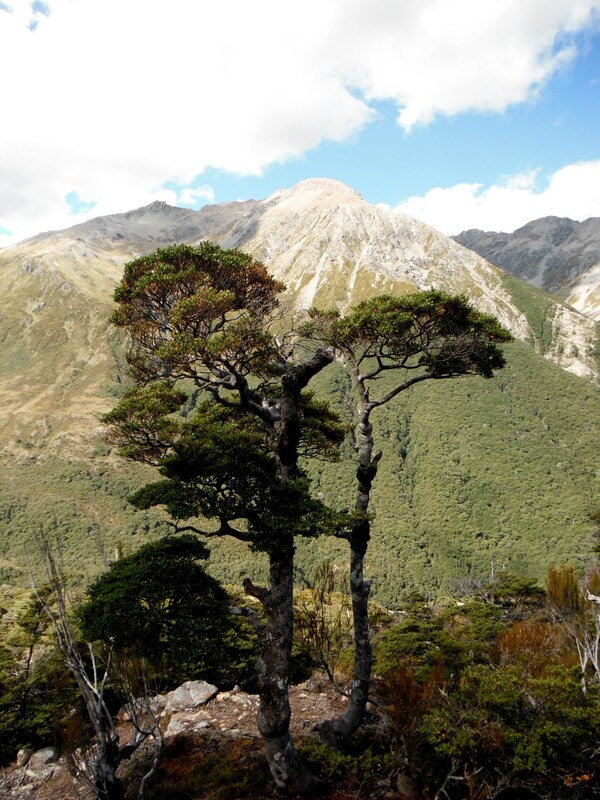 I had been in contact with the Uni tramping club (Kiwi slang translation: uni=university, tramping=hiking) a couple months ago looking for advice about where to go in the Canterbury area. 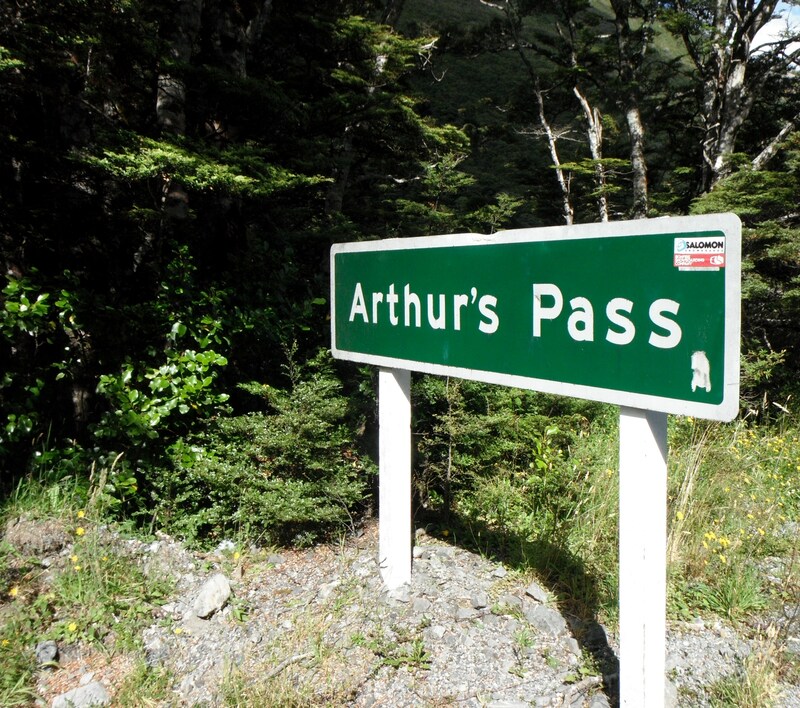 The name Arthurs Pass was suggested. I did some research and sorted out enough of the details to get me where I wanted to go, but not so sorted that I would lose the option for flexible spontaneity. Tramp somewhere for the day! So, this was the plan, but as usual I didn’t end up following it terribly closely. I decided to forgo the hostel on the second night and spend that evening in a hut that sits in the wonderful middle of NOWHERE. Also, my friend John Van Citters joined me for the first day of tramping. As I was packing and preparing John came up to my window to see what I was doing. He is also from the states (Seattle) and we ended up having a lovely time hiking the avalanche peak trail. The bus we found to take was called Atomic Shuttles and our pickup point was written as “CRM Ilam St. and Riccarton St.” I know where both Ilam and Riccarton roads are but what CRM means is, and will always remain, a mystery to me. We walked out to the intersection of the two roads, but saw no bus stop, and indication at all that we were in the correct place. The bus ended up finding us at a bus stop half a block down the street. The first step of our adventure (and the most important) was completed successfully! I watched out the window as the flat city landscape changed to fields filled with sheep, the fields changed to rolling hills (still with some sheep), and then hills gave way to mountains. The drab overcast clouds that hovered around us for most of the bus ride seemed to disappear as soon as we saw those mountains for the first time. Blue sky became the backdrop for our day. 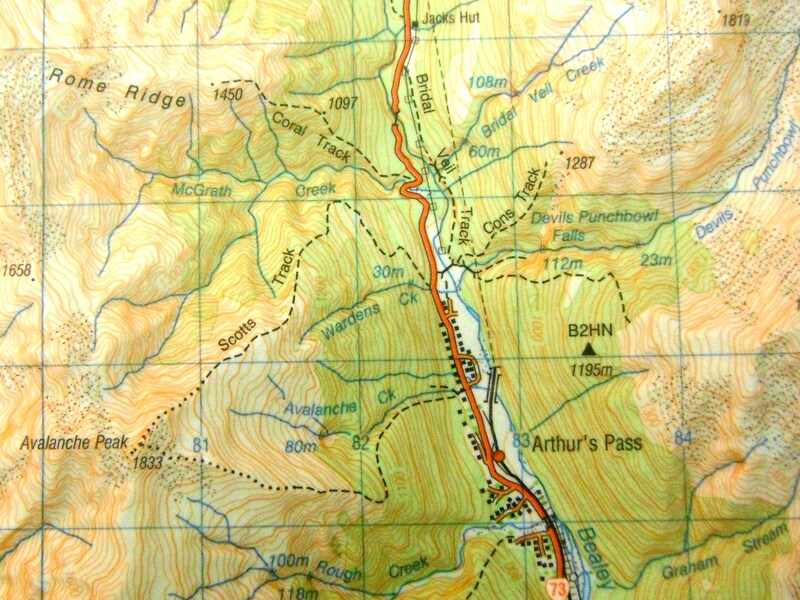 Arthurs Pass has a very interesting history that I won’t get into right now, basically: carriage roads, trains, tramping, mountaineering, skiing, & some mining as well I believe. Right now the town, if you can call it that considering that I don’t think anyone actually lives there, consists of a train station, the DOC (department of conservation), a hostel, a general store, a couple very small motels, a camping ground, and a couple restaurants. 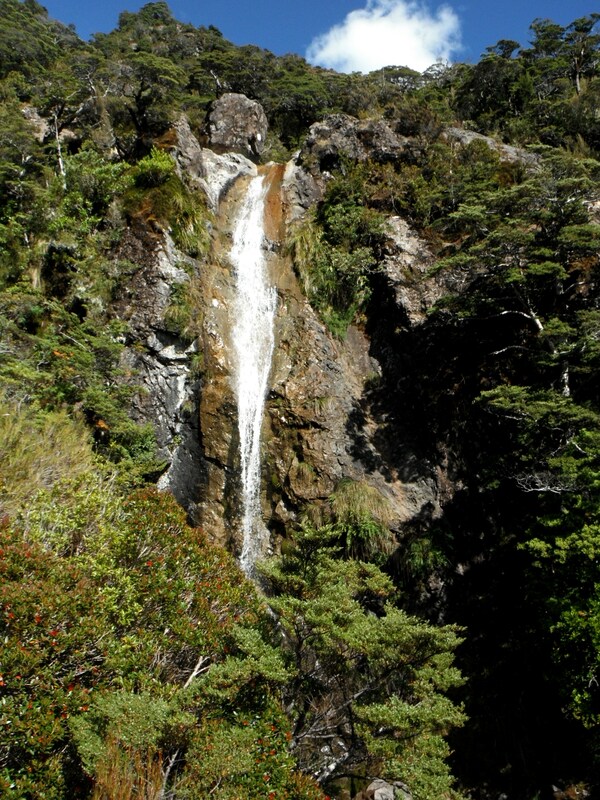 It’s the perfect jumping off point for a day of tramping. After visiting the DOC and deciding on the Avalanche peak/Scotts track loop we dropped our bags at the hostel and organized our day packs. I let John use my Osprey so that he didn’t have to drag his monster of an external frame pack up and down the hill. We set out and not even fifteen minutes into the climb we were rewarded with stunning views down the valley, as well as a pretty good sized waterfall cutting its way through the side of the hill. Pool at the base of the little trail waterfall. It was a tough hike and I was absolutely out of shape. We still made pretty good time considering our leisurely pace and frequent stops to take pictures. 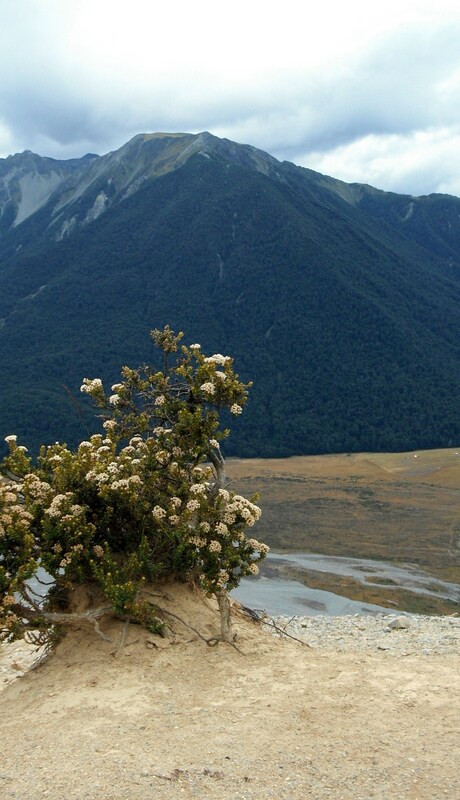 The NZ landscape that unfolded and rose around us as we walked was what I see in my dreams. The soaring peaks and low laying rivers colored finely with the entire spectrum of light in this world made my head spin, made me want to laugh and run and hold it all against my very bones. It reminded me of the Mary Oliver quote: “I was a bride married to amazement; I was a bridegroom taking the world into my arms.” The stern, almost whimsical mountains that rose around us made me want to pinch myself, assuring that I wasn’t asleep. And as I strained, sweated and fought against the uphill I smiled and laughed thinking: this is MY LIFE. This is me right now. This is how it should be. Every breath was a victory for me, a victory because I was in that moment opening my eyes to see that I am living the life I’ve always wanted for myself. Finally reaching the summit was immensely satisfying. From that peak I felt I could fly, from that peak I could see everything that is lovely in the world stretching to the very horizon. Up there on avalanche peak I was introduced for the first time to my new favorite bird: the kea. 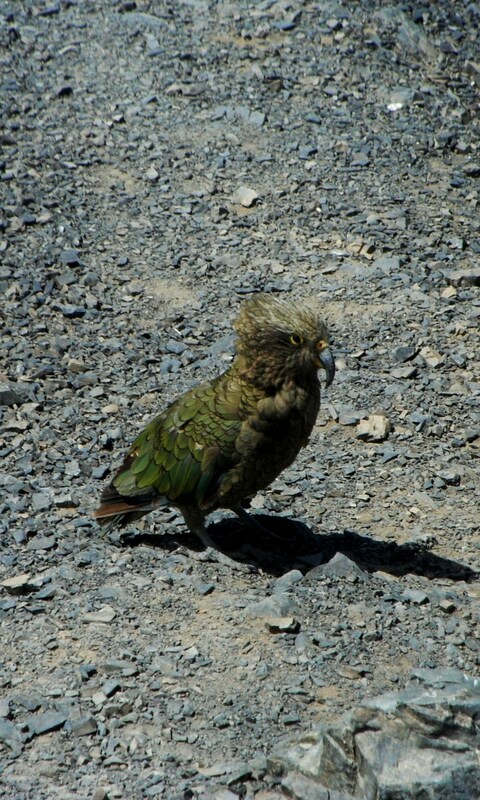 Kea are a kind of parrot and pretty rare, with only 5,000 still accounted for, but they are still all over the place on summits and down the in pass. I was warned several times not to leave anything unattended because the birds will get into and steal your things. Later that evening I heard stories from a couple German guys in the hostel about how the kea had flown around their tents all night pecking at the fabric. I like these birds for so many reasons. They’re mischievous, clever, smart, resilient. They’re little shits who have no fear of humankind. Mostly they are this dusty emerald color, very understated, but as soon as they take flight orange, yellow, blue, white and black feathers are revealed. As we sat there more and more of these sly birds started showing up, you would turn to see one edging its way towards the bag you left unattended eyeing you and moving steadily closer. After hanging out at the top for a while we started to head down. More beautiful scenery, more un-captureable views. Tired and sore we reached the bottom. 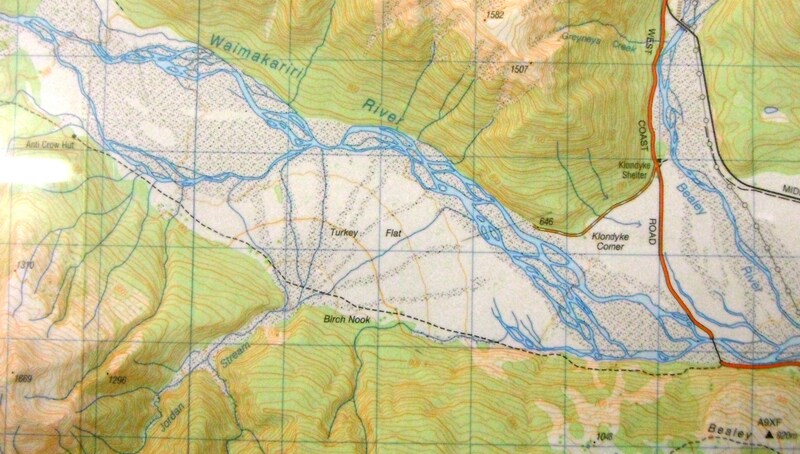 Back in the pass my love for the river was an entity was reawakened as we played in the Waimakari. Still with daylight to spare we dropped our bags and took off on the short hike to the Devils Punchbowl. 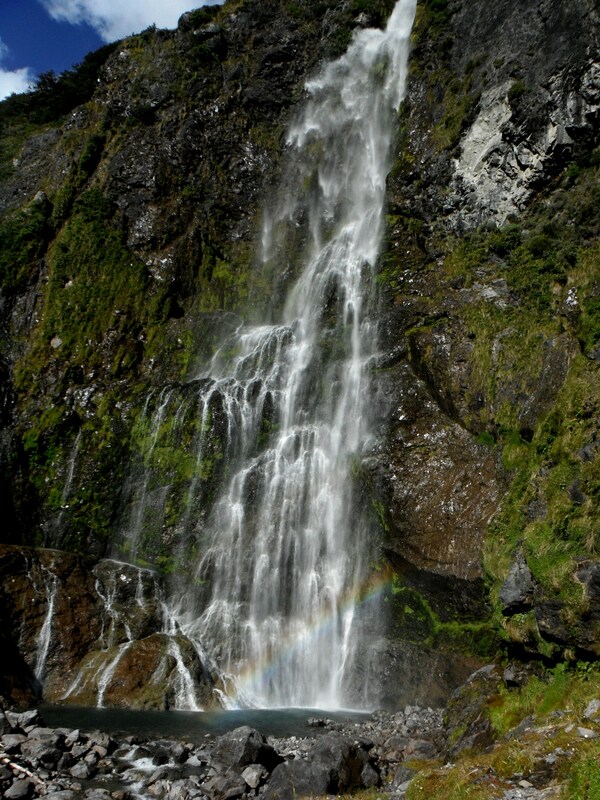 This was a magnificent waterfall. Absolutely stunning. 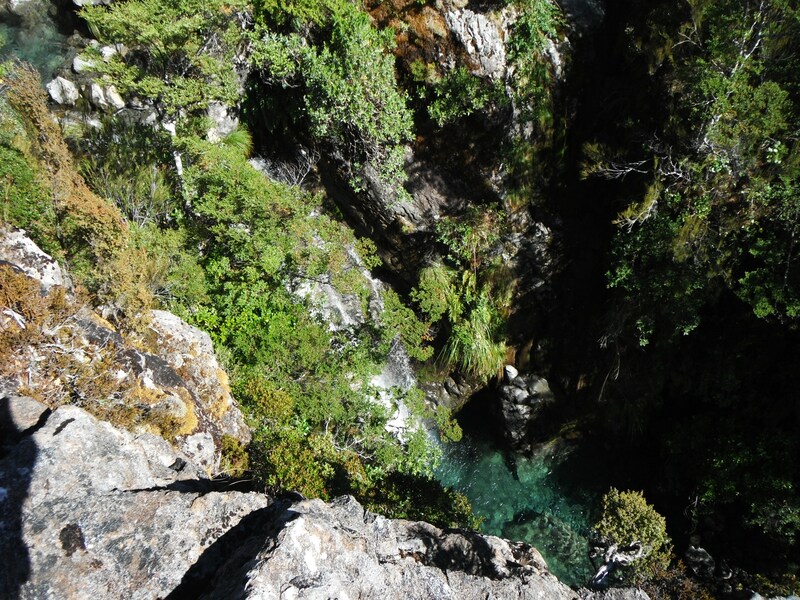 We set off from the main viewing platform on this small path that seemed to lead directly to the base of the falls. Ignoring the rock fall hazard sign we made it to the base. That waterfall is something that I will never forget. Water roared, mist propelled by the wind gravity coming off the 50 foot face swiftly flew by me, covering my arms and face with innumerable droplets. The pool was a rare kind of blue, crystal pthalo turquoise. For the photo op, but mostly for the adventure eased myself into the water. With the wind, mist, and fading sun that area close to the basin was cold cold cold. The water was chilly in the way that only mountain water seems to be. When I finally convinced myself to dunk under the water it was cold shock. My very breath was stolen, shaking, fumbling, numb: I closed my eyes and was thrown back into the cold memory of the SAR in Huntington’s Ravine. It was that kind of terrifying feeling. But this time it was coupled with victory, not defeat. 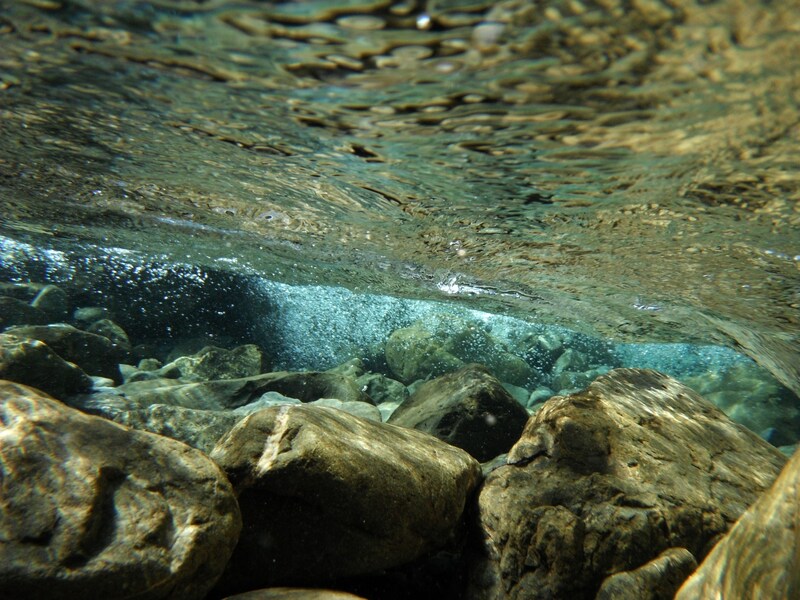 So I swam a couple small strokes in that water and looking up I could see the water seemingly suspended so far above, and the ever present rainbow wavering in the mist and sun. It was a beautiful and perfect moment, alone in that pool everything was simplified to cold water, mist, and prism of color. Back at the hostel I showered, changed, ate some cheese, crackers, fruit and drank some wine. I got so extremely sunburnt, and now have some really goofy tan lines from my capris and wristwatch. A German staying at the hostel exclaimed “You look like, tomato!”. Still I slept well and woke up the next day sore but ready for another day in the alps. 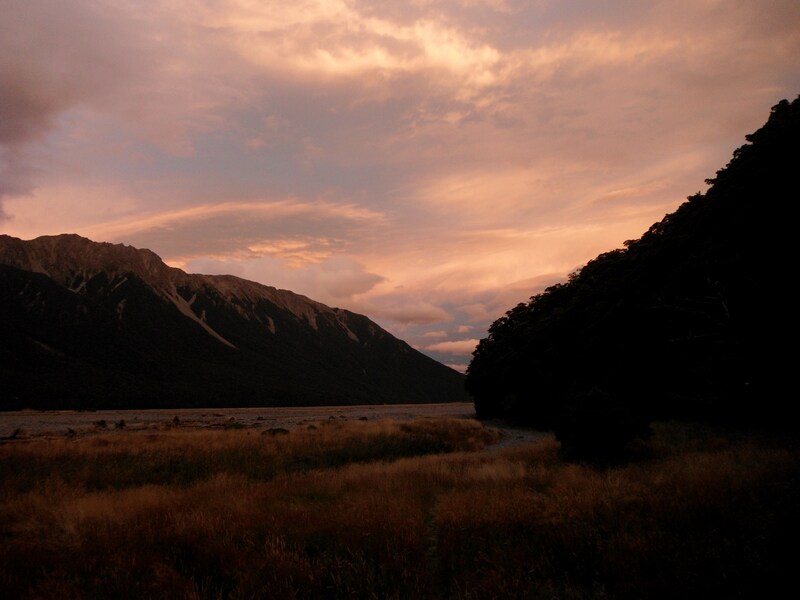 I decided to do the Bealy Spur track, and then walk out to the Anti-Crow hut to spend the night. 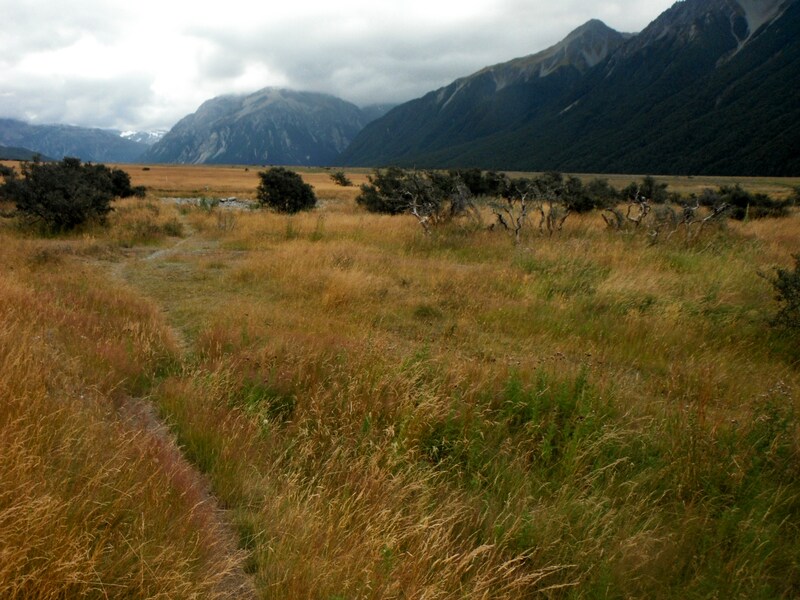 John caught a ride back to CHCH in the morning and I shouldered my pack to set off alone up the spur. 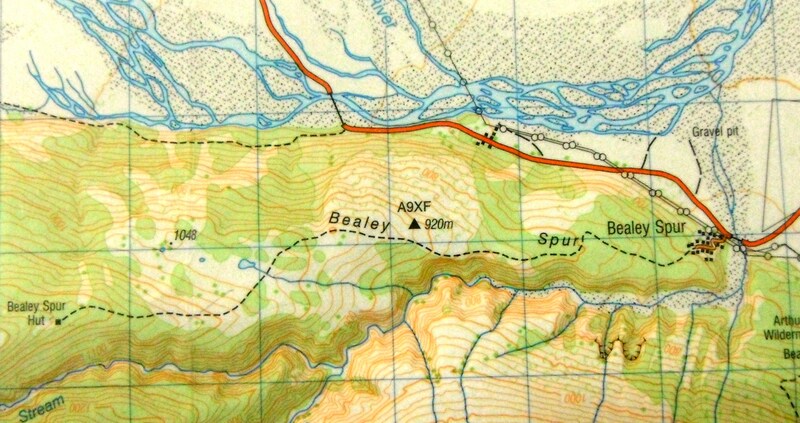 Bealy Spur track. 7.44 miles round trip (12k), 1,640 feet of vertical gain (500 m). It was another wonderful day. I was sore, and still am sore actually, but still I walked on. I saw rivers and flood planes stretching out to the very foot of the mountains, I saw fields of ebbing flowing yellow grass with the backdrop of grey mountainside. The shifting overcast clouds allowing blue spots of sky to come and go added drama to the spur. I was in awe. Back down to roadside around 2-2:30. Hitchhike to the second trailhead. And walk again. I was expecting the walk to the hut to take maybe an hour but instead it took a little more than two. Needless to say I was in a considerable amount of pain near the end of that day. I don’t regret going. On Bealy spur I looked down onto the fan of the floodplain, on this trail I was on the floodplain. There was no soul in sight. Walking a clear path alone in the valley between kings of mountains is an inspiring experience. All I heard was wind through the grass, the occasional bird, and the rhythm of my own breath. With the sky darkening a little with the promise of rain and no end in sight I actually started looking for a nice bunch of trees that I could camp under, but the thought of the hut kept me moving. Finally I got to it, a shabby, small, rickety hovel. But it was a roof, it was a place to sit and put my bag down, it was perfect. Perfect except for the damn sand flies, a creature worse than mosquitoes and black flies combined. Thank goodness no one else was there that night because like a total goofball I climbed in my sleeping bag line and pulled it tight over my head so that no bugs could get at me. I pretty much collapsed on a bunk and wallowed in self pity for a couple hours until the stunning sunset pulled me again outside. The beautiful sketchy little hut. The sunset that saved the day! That turned my whole night around, and when I got back to the hut the bugs were blissfully gone! I finally ate something, drank some water, and got some sleep. I woke up cold and quickly pulled my bag and boots on to head back to the road. The return journey seemed considerably shorter and I got a ride back to Arthurs Pass with a HUGE truck transporting cattle to the west coast. The driver asked if I wanted to ride along to the west, only an hour away, so that I could see the scenery and then he could drop me back at the pass on his way back through around lunchtime. I almost almost did it, but my hunger and exhaustion convinced me to get off. Back in Arthurs Pass and waiting for my bus home to CHCH I ate a “pottle of chips” (fries) and sat on a couch resting my tired body. That day I could not walk downhill. At all. I had pushed to my limit and paid the wonderful price. 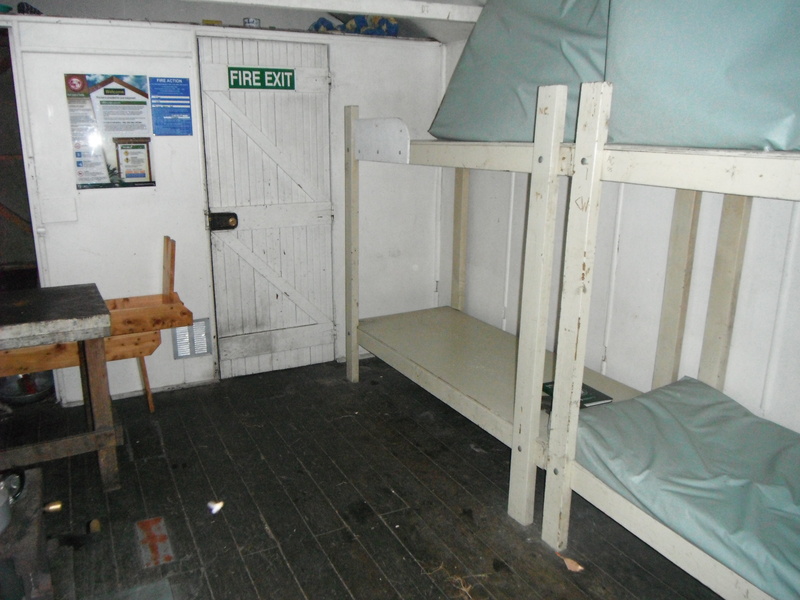 I was so miserable waking up Friday morning in that hut, but then back in the pass I was fed, warm, and content. I love this about hiking, running, biking, etc: sometimes you get real run down and unhappy but always sometime in the future you know that you will be once again warm and comfortable. If you give up part way through, if you turn back, stop moving, stop wanting to reach the goal, you’ll still get to that warm comfortable place. But you won’t have that sense of accomplishment, that pride in your actions under pain and pressure. I love this feeling, it’s like I survived some sort of test. I walked on when every physical part of me wanted to turn back. Push, push, test my limits, try my endurance, strengthen my will. Find joy in it. I spend those hours waiting for the bus sitting in the sun by the river. 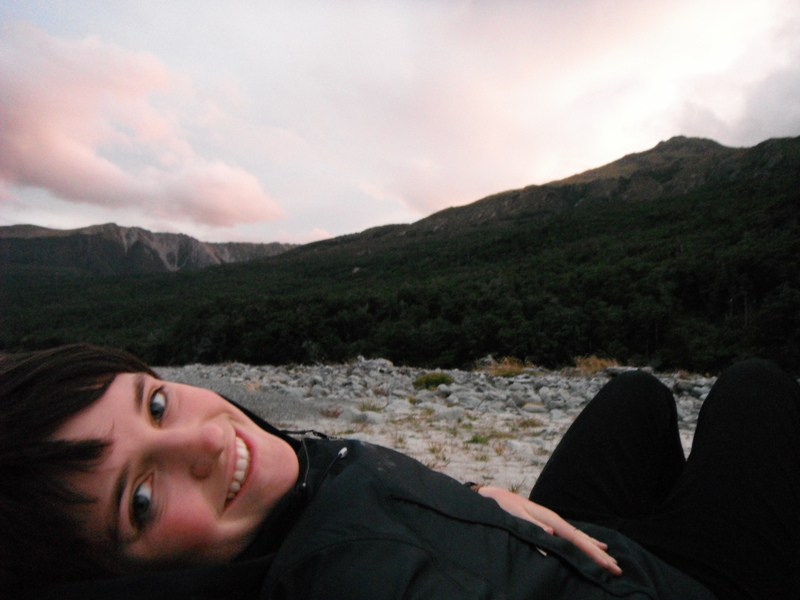 When I got back to CHCH I showered, unpacked, and looked through photos of the past few days. If one thing if for sure it is this: I am going back to that place as soon as I possibly can. In other news everyone has moved into flat N83! Philip arrived while I was away. He is a 22 year old business major from Germany. And Matt arrived just a little bit ago while I was writing this. We’re taking a flat photo ASAP to put up on our kitchen tack board. Philip is great and gets along really well with Sameena, Mackenzie, and I. So far Matt seems very cool as well. It looks like I got very lucky with my flat! Coming up this week is international orientation on Tuesday and the beginning of “O Week” (orientation week, a campus wide series of events to welcome back students.) This turned into a long post…but there was so much to tell, so cheers! Fantastic trip and pictures, keep the adventures coming. Awesome post. I don’t know you, but I like the way you write, your energy, your enthusiasm. Inspiring! Thank you Irene! It’s cool to know that people other than my friends and relatives read this blog. Sweet as.